With over 1,000 pubs throughout the city, Dublin embraces its age-old drinking traditions. Pubs are a part of the Irish capital's greater cultural fiber, and you can experience it for yourself on a Dublin pub crawl. Here are some of our top picks. Whether it's stories of James Joyce sipping on Irish whiskey or booze-fueled traditional Irish musical performances, there’s a lot of culture to be found once you get to the bottom of a pint glass. Choose a bar crawl that allows you to soak it up—between stops at festive pubs, you may stroll the streets of Dublin’s downtown to admire the statues and architecture and hear stories of the greats who once frequented these haunts. 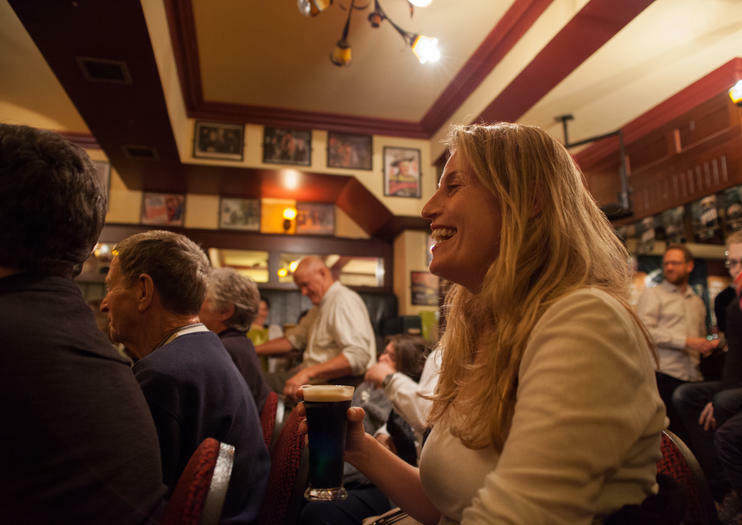 Choose a literary pub crawl to learn about Dublin’s masters of prose, or spend an evening with dinner, drinks, and a live show. There's an entire drinking subculture when it comes to sipping on Irish whiskey, and you could spend an entire vacation—or lifetime—furthering the depth of your knowledge. Start with a Dublin pub crawl that specifically focuses on whiskey, and you’ll travel between pubs to learn how the classic spirit is distilled, in addition to sipping on some premium labels. In the cozy confines of a dark pub, enjoy a guided whiskey tasting with seasoned Irish pros, or join in a whiskey and food tasting tour to nibble on chocolate and local cheese as you sip your drink. If the focus of your crawl is less about culture and more simply about a good time, consider a backpacker pub crawl to jump right into the party. Enjoy a crazy evening in Dublin with travelers from around the globe as you move between pubs and finish up at a thumping club for a night you’ll never forget. Sample the smooth taste of Irish whiskey on a 2-hour tasting tour in Dublin. With a whiskey connoisseur, visit three bars to try six of Ireland’s finest varieties. Follow in the footsteps of Oscar Wilde and Jonathan Swift as you visit Dingle Whiskey Bar and Bowes Lounge, establishments situated in the vicinity of Trinity College, and then conclude your tour at The Palace Bar, home to Dublin’s original whiskey society.